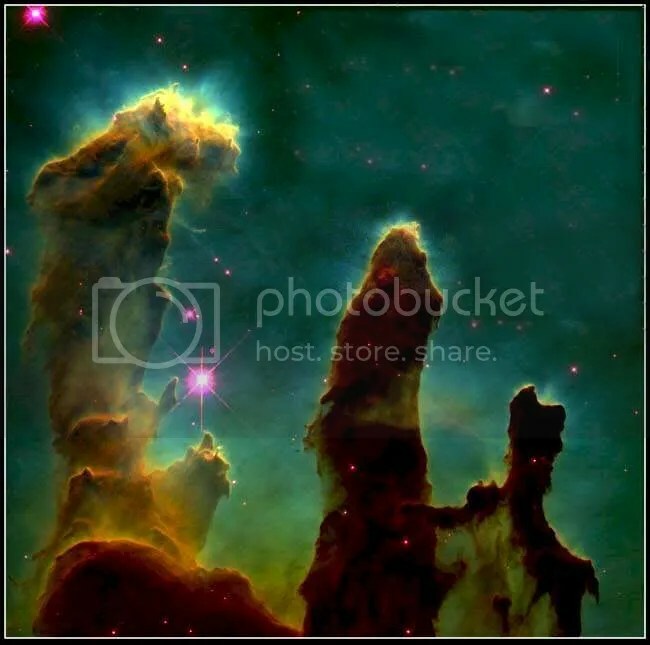 This haunting picture is not something out of science fantasy, but is an actual picture of the Eagle Nebula, and was taken on April 1, 1995 with the Hubble Space Telescope. These ghostly looking pillars are in fact made up of concentrated hydrogen gas, the most basic cosmic building block. What you are seeing here is literally an incubator for new stars. The size of each bud on the head of this giant star factory is roughly equivalent to our entire solar system. You can read more about this and other wonders of the universe here. If God does exist, then his existence is most clearly manifested, not in so-called Holy Scripture, but rather in stunning displays of natural wonder such as this. A god who had to rest after six days of labor is not a very inspiring god, but a God who has the breadth of vision (to say nothing of the attention span) to create a universe such as ours is an awe inspiring God indeed. i have no other words…. An astronomy lover, I am .. and this is just absolutely beautiful. I had read about it before, and seen pictures, but never like this one. I posted a bit about Sagan and the wonders brought by the practice of science, including two youtubes of him at his best (the second is the famous Pale Blue Dot reading, which really, every human being should see just once). Sagan really was a masterful writer and popularizer of some very deep awe. The graphics are pretty dated at this point, by the narration makes up for it. Sagan of course, is responsible for that dot picture existing: he was instrumental in getting Voyager to turn around and take one last picture of our planet as it left the solar system. I saw the post; very well done. Sagan was a great man who died far too soon. Stunning picture. Nicely put “thoughts’ as well. Awe-inspiring indeed. Thank you. I’m glad you enjoyed it. Thanks for stopping by.